Pastor Juan Bayo grew up in a Quechua Indian family in Sucre, Bolivia. Their religion was a religion of idolatry. The only doctors they had were the witch doctors. At a very early age, Juan began to question his mother about why they had to go to the witch doctors. He observed that no one ever really got well. As Juan watched his grandmother become completely blind, he wanted to know why they could not take her to a medical doctor in town. Sometimes on holidays when his family went into town, Juan would hear the Gospel message being preached in the public square. Even as a boy, Juan felt that God was calling him to bring health care to the Quechua people. When Juan was 11 years old, his father became very sick. Again, Juan asked his mother why they could not take his father to the hospital. Juan’s father died, and Juan dropped out of school to get a job and help his mother support his 4 younger brothers and sisters. In the years that followed, Juan was a very sick teenager, but his mother refused to take him to a medical doctor. She was afraid of what the witchdoctors would do if they found out. So, whenever Juan was sick, they continued to visit the witchdoctor and sacrifice animals to appease the spirit of his dead father. At the age of 16, as Juan lay sick and dying, some people from the town passed by with a horse drawn cart and insisted on taking Juan to the hospital. His mother finally consented and his life was saved. This experience served to strengthen Juan’s vision to bring health care to the Quechua people. When he was 18, he gave his life to the Lord Jesus. Juan was discipled by American missionaries and became a pastor. Then he met Pastor Ruben Baldiviezo, who was our mission pastor in Santa Cruz. Pastor Ruben told Juan about the work of Mission of Hope, where the poor can receive free medical care and medicines and also hear the Gospel message of salvation. Juan told Pastor Ruben that this was his dream for the Quechua people of Sucre. Juan had land that he inherited from his father. He told Pastor Ruben that he wanted to donate this land to Mission of Hope to build a medical clinic. After a trip to Sucre in the spring of 2007 to meet Juan and survey the land, we, at Mission of Hope, made the decision to step out in faith and open a second medical clinic in Sucre. A few months later, we received a phone call from a man in Georgia who had his own construction company and he wanted to know if there was a construction project he could do for Mission of Hope! So, right away, we began making plans! In February of 2008, the first Mission of Hope construction team went to Sucre. They spent two weeks digging the foundation of the clinic and left money for the local folks to keep working. During the months that followed, the walls went up and the roof went on. Then a second team went to Sucre in April of 2009 to paint and tile the floor of the entire clinic. The finishing work continued over the next several years whenever donations came in designated for Sucre. 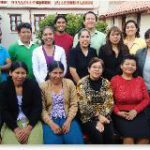 When we celebrated our ten year anniversary of the Santa Cruz clinic in July of 2012, we talked about our vision for Sucre. We were so encouraged by the donations that came in from the anniversary celebration that once again, we made a decision to step out in faith and set an opening date of February, 2013! After the September, 2012 surgery week was concluded, a small group of Board members from the United States and Bolivia went to Sucre with the goal of interviewing prospective staff. What God did in Sucre was nothing short of miraculous!! Within 2 days, we had our staff! God just kept sending people to us! They came to our hotel in a steady stream. Each person who came was uniquely qualified to fill a particular position that we needed to fill. Several of them told us that they had been fasting and praying this entire year for God to open a Christian medical clinic, not knowing anything about Mission of Hope. Every single one of them was available for the hours we needed them. Several of them told us that they were not working because they were waiting on the Lord for direction. 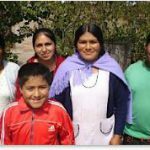 All of them speak Quechua, the language that is spoken in the community where we built the clinic. We were all just amazed! Even they were amazed when we invited them all to come to our hotel for a staff meeting so that they could meet each other and have a group photo taken. It was very exciting to all of us! Sucre is located high up in the Andes Mountains at an elevation of 9,022 feet. 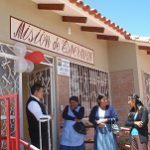 The clinic is located up in the hills that overlook the city in a community of about 5,000 very poor Quechua Indian people. These people are very hard working people, tending their animals and working the land to earn a living. They do not have access to good medical care. This clinic will be a tremendous blessing to them! Donations are needed for the on-going support of this medical clinic. Together, with your prayers and financial support, we are making a difference, both physically and for eternity! Praise the Lord! !